RS Elite number 20 Riff Raff has won the Tri-Handled Trophy for the best performing RS Elite in the first four days of Lendy Cowes Week for the second year in succession, skippered this year by Russell Peters whose 14-year-old son Freddie skippered last year when he won the RS Elite Class overall, White Group overall and the Young Skipper trophy. In this very competitive event Russell Peters and crew just pipped Ossie Stewart and crew in More T Vicar to take the trophy, finishing tied on equal points but with two race wins as against one for More T Vicar. The Tri-Handled Trophy is a magnificent silver cup presented to the fleet by Charlie and Julia Egerton-Warburton, owners of the Cowes-based RS Elite Soak Therapy. So far this year Lendy Cowes week has been characterised by light winds and big wind shifts making for difficult sailing in the strong tides of the central Solent. 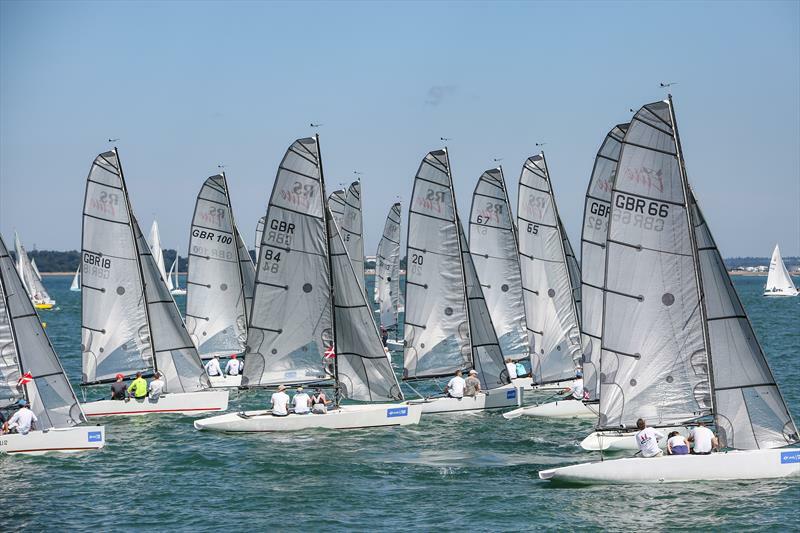 On days three and four there were long postponements before racing finally got under way, but racing was nevertheless closely contested in the highly competitive Elite Fleet. Day two saw several boats OCS, including Riff Raff. More T Vicar had established a strong lead by day three, but day four saw Riff Raff and More T Vicar tied on equal points after a discard had been applied. On the final reckoning, Riff Raff counted two firsts and a third whilst More T Vicar counted one first and two seconds, giving the trophy to Riff Raff. The RS Elite entry in Lendy Cowes Week is a record 21 boats this year with guest appearances from some members of the Swallow fleet. The fleet is now looking forward to the stronger winds forecast for the rest of the week.